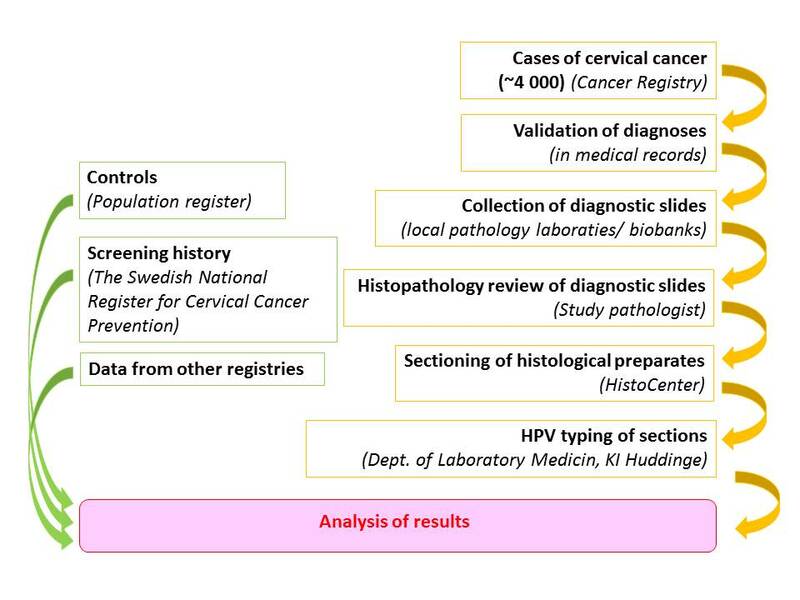 For the Audit of the current cervical screening program, all invasive cervical and unspecified uterine cancers from 2002 until 2011 were retrieved from the National Swedish Cancer register, and case validation through clinical records is ongoing. Through chart review, the FIGO stage, histological type, treatment modality, and treatment center can be determined for virtually all cases as well as the mode of detection. All 4652 primary invasive epithelial cancers have been individually reviewed by the same experienced gynecologist and a study database with of the cases has been established, into which information on clinical stage, treatment, histological review, and HPV typing is added. For each case, 30 population based controls have been selected and screening information for the past 20+ years, from the National Quality Register for Cervical Cancer Prevention, are added for both cases and controls. Evaluation of follow-up with an additional Pap smear, instead of colposcopy and biopsy, after ASCUS diagnosis in women below age 30. Risk of invasive cervical cancer after cytological finding with atypical glandular cells. Evaluation of cervical screening after age 60 for prevention of cervical cancer. Protection against adenocarcinoma of the cervix with cytological screening. Evaluation of cervical screening before age 30 for prevention of cervical cancer.